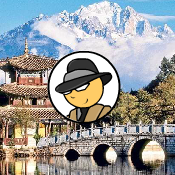 Sneaky's World Tour China is a new escape created by Selfdefiant for Melting-Mindz.com. Sneaky is traveling the world searching for hidden treasure. This time he's in China! Help him find all of the hidden treasure as quickly as possible for a high score! Ah the power of posting - got it! Actually - maybe better if I stop leaving this trail. Happy to give locations if anyone wants it *spoiled*. Hey Sugarcrush : ) Bird is on left hidden in tree. Can't find the knife, anyone knows? Missing the knife and disk. I know they're in 6 & 8. Disk in 8. Silver car. Knife in 6, left set of apartment windows. Whew, done! I think, I couldn't live in China - too many ppl & signposts/boards/ads are just overwhelming for me...! Lurker, check 8 for the disk, on the car. I'm still looking for the knife in 6. Thanks for the knife, Lurker. It's funny, my eyes must've looked at that spot a dozen times, but once I saw your hint, it popped out at me. can anyone help with green thing in 5 and camera in 10? Green thing in 5 is on big lighted sign upper middle, camera in 10 is in lower right corner by white bucket. Green thing in 5 is on the big lighted sign in the upper middle, camera in 10 is in the lower right by the white bucket. Gem in 7 is in a strawberry top on the ceiling. can't find the darn snowflake in scene 4 - the one with the sidewalk, a bazillion storefront signs, and the white van on the left... the only thing I have left.